Casto is studying renovation ideas for the seven-story former shoe factory, with a conversion to office space or luxury apartments most likely. He hopes to have a plan in place within a year and have the building renovated within three years. Months ahead of the opening, the area was dealt a slight setback when longtime neighborhood anchor Columbia Gas said it would move its headquarters and 650 employees to the Arena District in late 2014. The company, a major donor to the Scioto Mile project, has pledged to help find a new tenant for the building, which it leases from an investment group. Casto has studied that building at Front & Main for years. The firm I was with in the mid 1990’s had Casto as a client and looked at converting it to condos. Hopefully the time is right and they’ll do something with it now. Isn’t that the truth…its like trains or the 70/71 split, spend all of that money “studying” something that will never happen. To be fair, I don’t think it would have worked as condos (or apartments) back in the 90s. It might work now… About the same time Casto looked into the parking lot next to the City Center garage between Rich & Main – that seemed more viable since the mall was still in good shape. Maybe the parks (Cols. Commons & the Mile) along with the street scape improvements, courthouse, the Annex apts etc. will kick these other projects in gear. Are you talking about that big windowless storage building at the NW corner of Front & Main? It sounds like it, it’s the only 7 story building at front and main. Yeah, I’d think now would be a good time to revamp it. Not sure how costly it would be to convert to condos/apartments, but it’s surrounded on all four sides by new development. Prime location! That’s the building. I’ve never been inside but it looks like it could have an industrial loft aesthetic. The two-year-long saga of Bicentennial Plaza in Columbus could end soon with the scheduled sale of the downtown office building at a sheriff’s auction. The uncertain status of some parking at the building could, however, present added risk for any buyer. The 113,309-square-foot building at 250 Civic Center Drive is scheduled for a Sept. 2 auction, according to the Franklin County Common Pleas Court. The six-story property fell into foreclosure in August 2009, when lender GLIC Real Estate Holding LLC took Bicentennial Plaza Ltd. to court over failure to pay the $8.6 million balance on a loan due three months earlier. Bicentennial Plaza Ltd. was a partnership affiliated with Arshot Investment Corp. in Columbus. 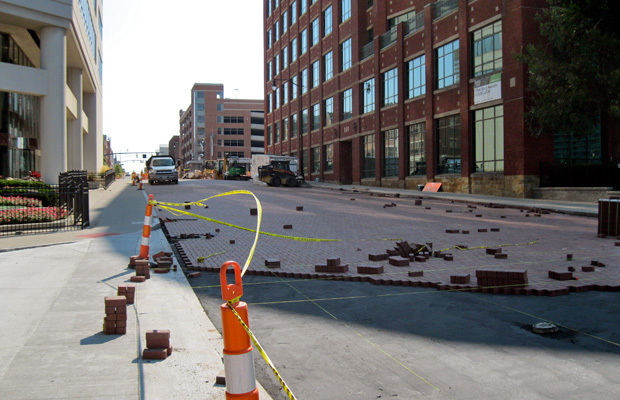 Love how many streets are being bricked. Also looks like Main is going completely two-way west of High. Or at least the stoplights are being installed that way. 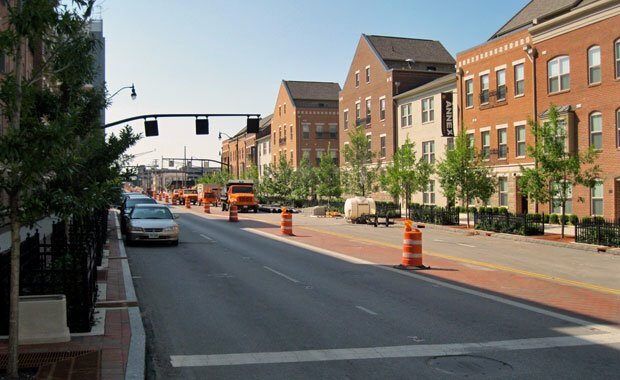 One more step in the redevelopment of the Riversouth neighborhood is completed as three sections of roadway are opened today to two-way traffic. They include South Front Street, between West Town and West Mound streets, West Main Street, between South High and South 2nd streets and West Rich Street, between South High and South 2nd streets. I hope to see more investment and taller (not skyscrapers) buildings being built. I think we’ve reached a point to where Downtown has officially become vibrant. I think downtown has come a long way since the early 2000’s but I would not call it ‘vibrant’. Setting the bar low is a dangerous thing. I have seen a HUGE transformation in downtown. 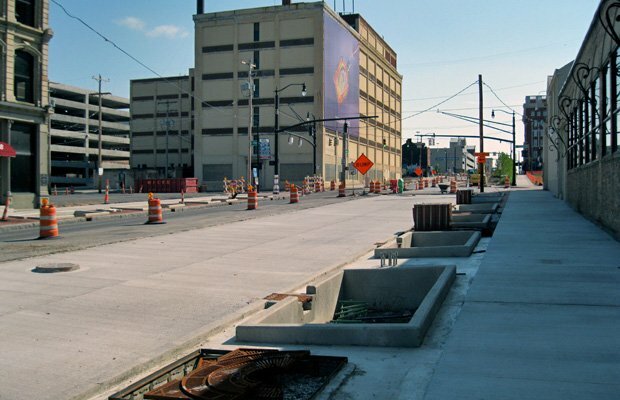 I remember 8 years ago, the majority of downtown was pretty empty. Now when I go down I see a ton of people. It’s awesome.